Champagne, we have been using it to celebrate special occasions and make ordinary ones extraordinary for centuries. Armand de Brignac (also known as as “Ace of Spades”) is the undisputed leader in the high-end champagne market. Their champagne is typically found on tables in some of the world’s most exclusive venues. The brand has become synonymous with the elite, as celebrities, athletes and socialites are constantly spotted with their signature gold plated bottles. When I heard that Nicole Rose Stillings and Nick Andreottola, who host the “Champagning” parties at Dream Midtown, were serving Armand de Brignac by the glass I decided it was definitely something I wanted to experience. 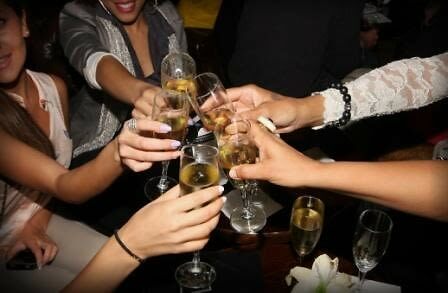 The atmosphere I found when I entered “The Bar” at Dream was one of celebration, one full of life. Patrons sipped champagne and chatted with friends throughout the intimate space. I spotted Carmen D’Alessio one of the founders of the infamous Studio 54 socializing at one of the tables. As I mingled with partygoers I ran into Lauren Fernstrom, the Public Relations Director at Armand de Brignac. We talked champagne, the history of her brand, and what went into this unprecedented partnership with Champagning (in between glasses of bubbly of course). Here is a taste of what I learned. HN: Can you tell me a little bit about the history of your brand? Lauren: Armand de Brignac is a limited production prestige cuvée made in Chigny-les-Roses, France. Our family winemakers - led by Jean-Jacques Cattier and his son Alexandre - trace their family's ownership of Champagne vineyards as far back as 1763. M. Cattier and his son oversee a completely handmade production for Armand de Brignac from vine to bottle with their team of just eight craftspeople. The small size of our team is unique and we are the only completely handmade champagne in the world. HN: What is it about your champagne that separates it from the rest of your competitors? Lauren: Both our quality and attention to detail are unparalleled. Armand de Brignac is truly at the top of the class when it comes to artisanal craftsmanship. But in addition to the Champagne being completely handcrafted, our limited production makes the imbibing experience that much more extraordinary. We are not mass-produced -- we only allocate 2000 cases per year for the U.S. across our Brut Gold, Rosé and our Blanc de Blancs Champagnes – so when you open a bottle, you know it will be special. HN: Ace Of Spades seems to have become the “elite’s” champagne of choice. Why do you think that is? Lauren: I think our limited production and insistence on quality encourages luxury connoisseurs to actively seek out our bottles. We sell Armand de Brignac in more than 100 countries and counting, which is very exciting. In the same respect, our production will never substantially increase in size, so as interest continues to grow, availability becomes more exclusive in each market. We actually created the largest bottle of champagne (30 liters) in the world, which we named the “Midas.” It is the most expensive bottle of champagne that has ever been sold (One recently sold in London for $190K). There is a nearly one-year waiting list to purchase one at this point! We also produce a gigantic 15L bottle called the “Nebuchadnezzar”, which regularly sells in major nightlife hubs around the world. HN: Serving Ace of Spades by the glass is extremely rare. What lead to this unprecedented partnership with “Champagning”? Lauren: If someone is going to buy a glass – or bottle – of Armand de Brignac, the quality must be completely perfect. So the corking and preservation of the opened bottle needs to be meticulous. 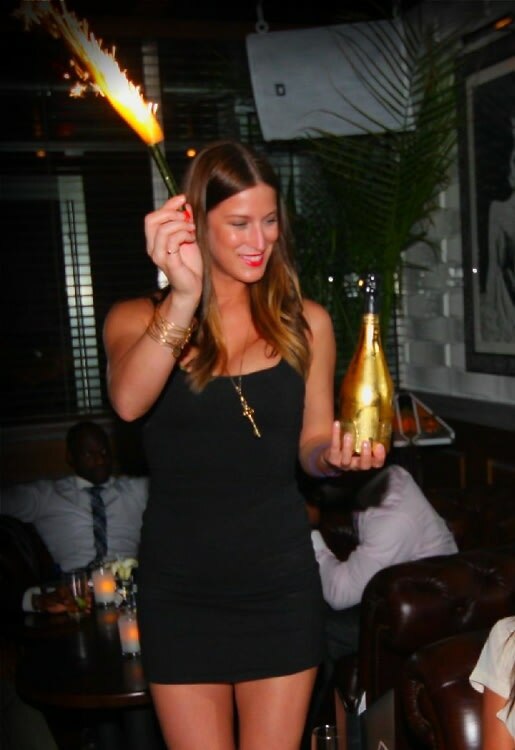 Champagning is a great fit for the New York launch of Armand de Brignac by the glass because what [Champagning founders] Nicole(Rose Stillings) and Nick(Andreottola) have done is curate a group of influencers who are champagne enthusiasts. This is a specific occasion where the experience itself matches the champagne. If you line up five glasses of champagne for most people they might not be able to tell the difference. But this is a group that can truly appreciate the experience and prestige of Armand de Brignac Champagne. The famous economist John Maynard Keynes once said "My only regret in life is that I didn't drink enough Champagne," don’t make the same mistake. If you’re a fellow champagne lover, then this weekly event should not be missed.